In a busy, hectic life, it’s hard to find the time to prepare healthy foods. Enter the Protein Bar – a nutritious snack that can replace a meal or satisfy those midday cravings, without adding a lot of calories, fats, or sugars. See our list of the top 10 best protein bars so that you can get the nutritional value you require during the day. We’ve researched the best protein bars and listed our favorite “top ten” below. The Quest Nutrition Protein Bar, Cookies and Cream is one of the best-tasting protein bars on the market. The company says it was made “because we care about what we eat, and we couldn’t find any nutrition bars on the market that we were actually willing to consume.” This one, at 180 calories per bar, makes a great snack for after a workout, or anytime during the day. It’s high-fiber, gluten-free, and has only 22 grams of carbohydrates. Ingredients include a protein blend, soluble corn fiber, almonds, cocoa butter, and coconut oil. Most of us can’t eat candy and still look like a fitness model – so the Quest bar is the solution. It’ll make you feel like you’re cheating on your diet! 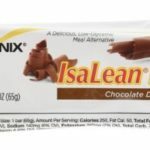 ISAGENIX Chocolate Decadence Bars are loaded with high-quality undenatured protein from pasture-fed cows. For muscle strength, whey protein is low in lactose but high in amino acids. This bar is ideal for vegetarians, as it contains a healthy balance of protein, fats, and carbohydrates. Each bar has 250 calories and is gluten-free, so it’s a great meal replacement bar. It will satisfy your hunger for hours, and it’s so tasty, you’ll forget it’s good for you. Take some along when you travel or go to work. The Vega Sport Protein Bar is plant-based, gluten-free, and non-GMO. This product was formulated by Brendan Brazier, a professional triathlete and best-selling health author. It is designed especially for vegetarians who want to stay fit – the 15 grams of plant-based protein help build muscles after a workout, and the 2.5 grams of BCAAs and 2 grams of glutamine help repair and rebuild muscle tissue. Each bar has 220 calories, but no gluten or artificial flavors or colors. The Saviseed in it is a great plant-based source of Omega-3. These bars taste great and fill you up! The ProBar Base Bar is a healthy snack that will give you energy and satisfy your sweet tooth. Certified organic, it’s designed for people who live an active, health-conscious life. It’s gluten-free, non-GMO, and contains almost 300 calories per bar, with 5 grams of fiber and 20 grams of plant protein. The ingredients include soy protein, organic tapioca syrup, ground peanuts, organic cane syrup, and natural flavors. Not only does it taste like real crunchy peanut butter and chocolate, it also builds strength. So whether you’re hiking, traveling, or working out, this will satisfy your needs. For taste, nutrition, and plenty of protein, try the Pure Protein Bar Variety Pack (6 Chocolate Peanut Butter, 6 Chewy Chocolate Chip, 6 Chocolate Deluxe), from Pure Protein. This is an ideal snack for busy, on-the-go people. This healthy treat contains at least 20 grams of protein per bar, plus vitamins and minerals. Every choice in this pack is chocolatey, chewy, and gluten-free. The taste is not dry or chalky, nor is it overly sweet. It has a good balance of sugars and carbohydrates. This is a great replacement for those junky snack foods. It fits nicely into a weight loss regimen, and you can even send it to your son in boot camp! Another great variety pack is the Oh Yeah! One Protein Bars Variety Pack. These tasty bars include the following flavors: Almond Bliss, White Chocolate Raspberry, Chocolate Brownie, Cookie and Creme, Lemon Cake, Peanut Butter Pie, Chocolate Chip Cookie Dough, and Birthday Cake. They taste like dessert, yet they’re good for you. Certified gluten-free, each bar has 190-220 calories, but only one gram of sugar. The texture is soft yet chewy, like a brownie, and there’s no umpleasant aftertaste. Designed for people on the go, these bars provide power and nutrition for all your activities. The STRONG and KIND Thai Sweet Chili Savory Snack Bars, are almond protein bars which boast “ingredients you can see and pronounce.” Gluten-free, soy-free, whey-free, and non-GMO, they’re made from whole almonds, seeds, and pea protein. Each bar provides you with 10 grams of complete protein and all nine essential amino acids. It’s also low in sodium and has no MSG, no transfat, and no cholesterol. Other ingredients include honey, glucose, sea salt, and a variety of spices. Despite the name, the taste is fairly mild. At 230 calories, it will satisfy your craving and energize you too. CLIF BUILDER’S Protein Bar is made for people who work hard, or work out. It delivers a whopping 20 grams of protein to build and maintain muscles, with carbohydrates for workout recovery. The ingredients are not genetically engineered; they contain 23 essential vitamins and minerals, including calcium, iron, vitamin A and vitamin C, to keep you energized through a long day. What they don’t have are transfats, partially-hydrogenated oils, or high-fructose corn syrup. This bar also tastes good! It’s crispy and dipped in cocoa. Take it anywhere for a quick boost! KIND Bars, Pomegranate Blueberry Pistachio + antioxidants, are Gluten-free and are some of the tastiest protein bars on the market. They are all natural and are a good source of fiber, for a healthy digestive system. In addition, they contain 50% of the daily requirements for antioxidants, and vitamins A and C. They contain NO cholesterol, dairy, transfats, sulfur dioxide, or hydrogenated oils. At 190 calories, each bar has 3 grams of protein and a nutty, chocolately taste. These are ideal for people who don’t want gluten or milk products. Whether you’re at home, in the gym, or on the go, these bars will curb your cravings and help you maintain a low-calorie diet. When you’re working out in a gym, hiking on the trail, or just working in your office, you need a nutritious boost without a lot of fuss. Protein bars fill the bill, as they will satisfy your hunger while providing you with the foods you need for strength, alertness, and general well-being. They’re quick, easy, low-cost, and will lift your spirit while sustaining your body. Check out our list of the best protein bars on the market from all brands. Whether for breakfast or a workout, our protein bar reviews will give you the facts you need to know! Save BIG on Protein Bars! Copyright © Best Protein Bar 2016.